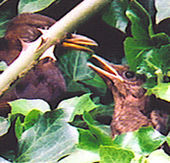 Blackbirds (Turdus merula) have built nests in this Yorkshire garden, usually in the ivy, most years. Other species have nested here, but none as frequently as the blackbirds. There are sometimes two broods from the blackbird pair in the course of one year. Unfortunately most of the young birds don't survive, as they are caught by cats, and on at least one occasion it appeared that one had been taken by a sparrowhawk. I do my best to keep our cat Rosie indoors when I know that young birds are emerging from the nest. It's always entertaining watching the blackbirds collecting nesting materials. Most memorable, one spring, was watching a female blackbird tugging repeatedly at the foliage of dwarf irises. These leaves are long and grassy, and probably suitably pliable for building into a nest. Unfortunately they were still attached to the bulbs. There were ways to help this frantic blackbird and other birds in their nest-making. As I was tidying up the garden I left a small pile of dried grass, twigs and grass clippings near the pot of iris foliage she was trying to get hold of. This succeeded in distracting her from my poor besieged irises. On her next visit she switched her attention to some of this stuff I'd put out, rifling through it like someone at a jumble sale, and then flying up into the ivy with some of the grass clippings. Similarly, when I got around to emptying the half-rotted compost out of the compost bin, I left some of it on the ground near to her nesting site, so she could pick over that too, which she did with great gusto. My reading up on birds and their nesting suggested that the blackbird may need mud for nest building. After a week of dry weather there wasn't much mud around, until I watered in some plants I'd just planted out, and she appeared as soon as I moved away, gathering mud from these newly wet areas. Garden vandalism . . . The following day I found wet compost all over the paths, as she'd gone through all my watered pots, and pulled out the top layers. Rather a messy scene. I had to accept this as all part of the rich and varied - and often messy - experience that is `wildlife-friendly' gardening . 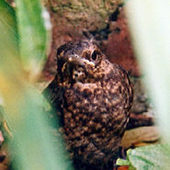 . . And worth it when the young blackbirds come out of the nest and are hopping all over the garden. 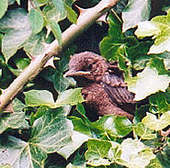 Young blackbird emerging from the nest in the ivy. Young blackbird more interested in being fed than in leaving the nest. 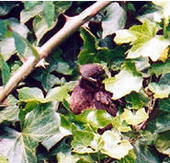 Young blackbird hiding in the undergrowth, probably wondering why this person keeps following it about.